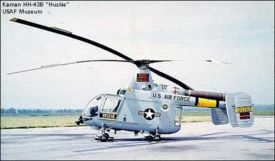 The Kaman HH-43 Huskie is a helicopter that was used by the United States Air Force, the United States Navy and the United States Marine Corps in the 1950s through 1970s. It was primarily used for aircraft firefighting and rescue. It was originally HOK and HUK under the USN. This page was last edited on 6 March 2007, at 09:43.